When it comes to capturing existing conditions, the first question in everyone’s mind seems to be “to scan or not to scan?” With all the technologies out there, the next question is usually “which tool is best for the job?” Complicating the ability to answer these questions is the accelerated pace at which new technology developments and commercially available products enter the market. When overwhelmed by choices—especially new, unproven and expensive options—we’re often moved to inaction, making it difficult to invest in the proper technology. But if we don’t invest now, we will fall further behind our competitors. This isn’t fear-mongering; it’s the reality of reality capture in the current AEC industry. During the last couple years, we have invested in a wide range of reality-capture technologies ranging from traditional, ground-based survey tools to terrestrial laser scanning to unmanned aerial vehicle (UAV)-mounted capture platforms. We now find ourselves flying drones on jobs that previously may have been captured with terrestrial-based scanners. Drones seem to capture the majority of headlines these days, but terrestrial, tripod-mounted LiDAR scanning is just as important as it always has been, and even more so with the increase in coordinated BIM models. So with the different types of LiDAR systems available, how do you know where to invest your organization’s time and money to stay relevant in this constantly evolving landscape? Start with understanding your options. LiDAR (short for Light Detection and Ranging, usually referred to as “laser scanning”) systems come in a variety of configurations based on several features and functions, including whether the device is stationary or mobile; terrestrial (ground-based) or aerial; range and accuracy; and price. Each feature can be further subcategorized and combined, potentially making the number of consumer options confusing if not downright overwhelming. Terrestrial LiDAR likely is the most familiar (and widely used in our industry) form of LiDAR. It’s also one of the most accurate forms of survey (yes, terrestrial LiDAR scanning is surveying. See “The Death of Traditional Surveying Has Been Greatly Exaggerated,” center box.) Terrestrial lasers typically have the sensor positioned on the ground, and its exact location is measured using geodetic methods (e.g., distances and angles, etc. ), and subcentimeter accuracies routinely are achieved. Targeting and using survey control allows for a more-accurate scan job and ensures the scan can be referenced to something in the real world. Terrestrial scanners from all major equipment manufacturers have been on the market for more than a decade and are fairly common. UAV-based systems (often referred to as “drones”) come in one of two flavors (and sometimes a third, which is a combination of the first two). The first (and less expensive) type is drones equipped with 3D photo cameras. New photogrammetry hardware and software configurations combine many multiple overlapping images of a given region to enhance the accuracy of the 3D model of the area captured. Although this greatly improves the 3D models created in bare-earth regions, it actually decreases quality in vegetated areas, so if you need to map below obstructions such as tree canopy, buildings or anything else, LiDAR is required (or at least recommended). For almost all projects with heavy vegetation, we spend a lot of extra time cleaning up the data and typically spend more time on the ground spot checking areas within the vegetation. LiDAR, the second and more-expensive flavor of drone-based systems, can capture more true ground shots, leading to a more-accurate classification of the true ground elevations. It’s an important distinction that continues to define where and how the technology is going to provide the best fit. When considering investing in the purchase and implementation of a LiDAR system, it’s important to understand the pros and cons of such an investment. Even some of the most basic terrestrial scanners take almost 1 million shots per second—and in color! Try asking your surveyor to gather that much information. However, don’t be fooled by the ease with which you can capture these vast amounts of data: proper scan planning and location placement is key. Remember, successful data capture relies on a clear line of site, so, if you can’t see it, then more than likely the scanner can’t. In addition, terrestrial LiDAR won’t penetrate walls, vegetation, snow, etc. LiDAR scanning is much less intrusive than traditional survey, and you’re typically onsite for shorter amounts of time. A recent scan job of ours was a large ammonia plant—the plant could only be down for two total hours, and, of course, they needed detailed mapping of the system. To make the job even more difficult, we were in hazmat suits so we wouldn’t be exposed to the chemicals. We were in and out in about 45 minutes and captured all the information needed for proper modeling. As another example, consider the hazards of trying to collect survey data in a busy four-way intersection. It’s like a real-life version of the video game Frogger with much more serious consequences if you get hit by a vehicle. With LiDAR, this dangerous situation becomes much safer. Simply set up the scanner on each of the four corners and another in the middle of the intersection, and collect all the info you need in relative safety. What’s the market demand? What’s your demand? How do costs/time compare to traditional survey? What new business can you create? These are all questions we asked ourselves. On the initial scanner investment, we predicted our equipment (hardware and software) would be paid off within 36 months, and, if we were more aggressive, we assumed 24 months. After careful planning and marketing, we found the initial growth to be much faster—within 18 months we were able to successfully complete jobs, remove all financial burden from the scanner and ensure the ROI stayed high. A 2D drawing—hand measured or traditionally surveyed—just doesn’t give the client the “wow factor” they need (and often now come to expect). And in most instances, a 2D drawing couldn’t accurately portray what’s happening within the project. LiDAR scanning provides such a dense point cloud, and in real color, that it’s almost like being there yourself. You can take more measurements throughout the model and create accurate/complex piping systems directly from the point cloud. Many articles on the topic of laser scanning stop with the pros and avoid the cons—this isn’t one of those articles. Below are some of the drawbacks of getting into, and staying up on, all data capture technology. Although the prices of LiDAR scanners have gone down in recent years, a new scanner can still carry a hefty price tag. Some of the new systems such as the BLK360 from Leica can get you into the scan world for a much lower investment, but also come with limitations. Therefore, it’s important to do the research, and think about your market and which jobs you intend to go after. All scanners aren’t created equal, and some may not perform well on your intended project, so know what you need before you buy. Scanning hardware has been pretty simple to learn, and some devices integrate with mobile devices we use every day. Some systems are a bit more complex, but after you complete a few projects, it’s just like riding a bike, which also helps in the onboarding process for new hires. How do you accurately reflect a very complex piping system if it were a 2D drawing? However, it has taken some time for the software to catch up to the hardware to fully exploit LiDAR technology. For a while, it was great that we could capture copious amounts of data, but then what? 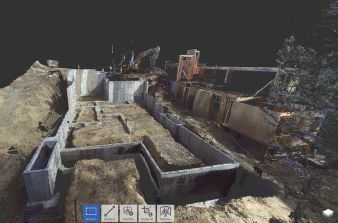 There are several software applications available for scan registration, auto feature extraction, viewing, creating classifications, “virtual surveying,” and on and on. With so many options, it takes effort to determine which software is best for you. Usually you’ll need more than one software application, and each one comes with a slight learning curve. LiDAR isn’t a “one size fits all” tool. As such, we continuously mix terrestrial-based LiDAR scans with UAV-flown projects, or traditional survey with LiDAR- and UAV-captured data. On a recent project for an oil and gas company, we captured in detail the main portion of a building and conveyor belt with our FARO terrestrial LiDAR scanner, and supplemented those data with a flight of the 20-acre site. The combined data resulted in a detailed as-built of the focal area as well as a way for those offsite to understand the bigger picture without the cost or time involved in scanning the entire project. At the outset of every project, we always work with the client to clarify the goals and desired end product; the level of detail of the model (will it be used for modeling or only planning? ); and whether the client only wants/needs a 3D point cloud or a true horizontal and/or vertical as-built. Most of the time, when a client wants something “LiDAR’d,” they simply want a 3D point cloud. But it’s always good to dig deeper, ask them what the end goal is, and ask about the project’s purpose. Sometimes just a few questions can help decide what tool to use and why. There’s a huge difference between a piping system that needs to be 3D modeled in Revit vs. a piping system where they just want a good representation of the existing features. needed, and a drone flight of the entire site helped supplement the data. It sounds a bit odd, but timeline, cost, data acquisition and turnover all are fairly dependent on just a few simple questions. Being impartial to any specific technology and understanding the strengths and weaknesses of different technologies in our toolbox helps us recommend the most suitable and cost-effective approach to each and every project. Think of using all these technologies like baking a cake: with the proper ingredients and techniques, you can create something amazing. But if you throw an inexperienced cook into the kitchen with shiny tools, you have a recipe for disaster. Many people, myself included, have invested in a lot of technology early on and have gone through and overcome many obstacles that you surely will face. To avoid disappointment, slow or non-existent ROI, and customer disappointment, consult with someone who has done it before, invest in training if needed, and, whatever you do, don’t do it alone. The market is quickly learning the pros and cons of vehicle-mounted lasers, stationary/terrestrial lasers, dual scan/survey equipment, drones and so on. The cool thing, at least to me, is that by the time you read this, the technology has already changed. We live is a rapidly evolving time, and I look forward to seeing something new every morning when I wake up. 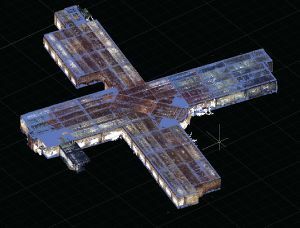 An image shows a laser-scanned 80,000-squarefoot wing of a hospital renovation. Project Description: Capture all data within a full wing of an existing hospital for renovation. 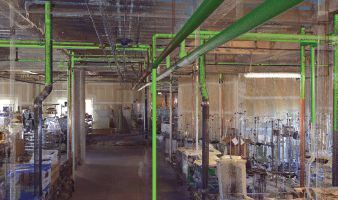 The capture was post data, ensuring all exposed piping would be captured and then accurately modeled. 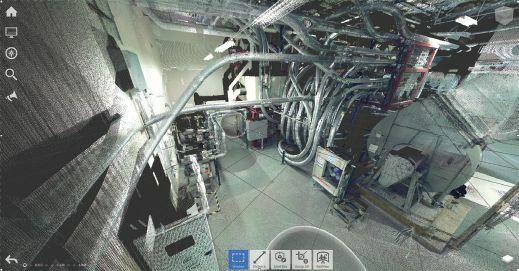 An interior hospital scan shows 3D modeling of the piping systems. Project Description: Even for projects that seem simple, a few quick scans can tell a lot. The examples shown are simple foundation- and slab-verification projects. 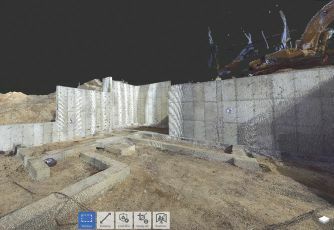 Scanning a foundation, prior to steel being shipped or cut, can limit “beat to fit, paint to match” scenarios as well as capture major changes before equipment and materials are shipped to the site. Shawn Herring is co-owner of Reality One, specializing in 3D laser scanning and reality capture. He has been a part of hundreds of LiDAR scanning projects, ranging from roadway scans to complex scanning of major hospital remodels; email: sherring@realityone.net.